It is essential to place orders prior to 3PM Eastern Time for guaranteed next day arrival. We will do our very best to expedite any orders after 3PM, but cannot offer any guarantee for later orders. We ship through UPS, and due to UPS's rules we cannot ship to P.O. boxes or unnumbered routes. You do not need to sign for your package. It is best if someone can personally accept the package, but should this be impractical residential deliveries will be left in authorized areas according to UPS regulations. Non-deliverable packages will be available at the UPS station or can be re-delivered the following day. How will my lobsters arrive? Lobsters come from the cold, wet bottom of the sea, and stay freshest in similar conditions. They will arrive in a shipping box with wet newspapers and a chilled gel pack to keep the lobsters refrigerated and moist during shipment. How do I cook my lobsters once they arrive? Cooking live lobsters is very easy, and best done by boiling. Take a pot large enough to hold the lobsters with room to spare and fill halfway to 2/3s full with water. Salt the water to taste. Bring water to a boil, then place lobsters in the pot head first. When the water returns to a roiling boil over the lobsters start timing. It will take about 12-15 minutes for hard shell lobsters, 7-8 minutes for soft shell. When done, take out of pot with tongs, and give the lobsters a chance to breathe a few minutes. Once cool enough to handle, start crackin' and enjoy with crackers, butter, or any other condiments you enjoy! What are proper storage times for live and cooked lobsters, shipped lobster meat, and shipped fish? Live Maine Lobsters can survive up to 12-18 hours. Our guarantee ends with the delivery of shipment. DO NOT place lobsters in the freezer or use ice. Fish and other seafood is best used within a day. All fresh seafood, including lobsters, should be stored in the coldest part of the fridge, although to maintain freshness it should not be frozen. Can I get a gift certificate for Pine Tree Seafood? Yes! Gift certificates are available in any amount of $25 or greater! They can be used for all aspects of an order, including shipping, or can be used for orders picked up and made at the store. We can send your gift certificate to the recipient via USPS or email along with an appropriate thoughtful card. We also have special holiday themed gift certificates. 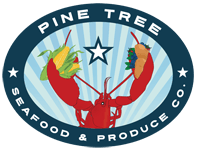 Is Pine Tree's seafood sustainable? Pine Tree Seafood is committed to sustainability and protecting the waters that are the livelihood of local fisherman and a huge part of our history and community. We work with only those fishermen and companies who are committed to products that are harvested from regulated environments. There is no minimum! We welcome orders of all sizes. What is your shipping range? We ship anywhere within the continental United States. Unfortunately, we are unable to ship to Hawaii or Alaska. We believe that the customer is always right. We will always return full payment if you are not completely satisfied with your order.